주얼리의 경우 나는 자연을 뜨겁고 강렬하게 형상화한 것을 좋아한다. 특히 타는 듯한 여름에는 더 그렇다. 브라질은 늘 뜨겁다. 색감은 물론 영혼까지 모두! 그래서 리우에 뿌리를 둔 세계적인 보석상 ‘H.스턴’은 새 컬렉션에 붉은 기운을 더했다. 로즈 골드로 틀을 만들고 꼬냑 빛깔의 다이아몬드로 세팅한 나비와 새들은 자연의 강렬한 생명력으로 충만하다. 이를 창백한 공주 같은 다이앤 크루거의 아름다움과 연결 지어 생각해보자. 생생한 날 것과 세련됨의 흥미로운 조합이 탄생할 것이다. 나는 그 보석들을 처음으로 진열된 형태(다이앤 크루거가 착용하거나 사진이 찍힌 한여름의 들판이 배경이 아니었다)로 가까이서 봤다. 로즈 골드 틀에 빽빽이 박힌 핑크 다이아몬드의 아름다움을 본 뒤 보석 디자이너들은 이 컬렉션을 ‘펑크 록’ 스타일이라 정의했다. 나는 이 보석들이 ‘록’적이라고 여기지 않는다. 그런 이름이 도회적이고 터프하게 들리는 효과가 있긴 하지만, 이 보석은 자연이 자신의 진정한 색을 보여주는 거라 생각한다. 그것은 ‘인정사정 봐주지 않는’ 자연과는 거리가 멀다. 특히 나비(굵은 커프를 장식했다)는 섬세한 날개 짓을 암시한다기보다 기하학적으로 휘어 있다. 새와 나비의 경우 날개를 생생하게 제작해 친근한 보석 디자인에 보다 강하고 모던한 날카로움을 더했다. 장밋빛 녹주석인 모거나이트와 연수정 같은 다른 보석들을 첨가하면, 자연의 모습에 불타는 느낌도 더해진다. 가장 극적인 작품은 새와 나비와 목 뒤에 벌이 장식된 연수정 목걸이다. 이 대담한 디자인은 자연의 풍성한 느낌을 선사한다. 그러나 겨울이 시작될 때 멀리 날아가는 새들(날개가 추상적인 기하학 오브제로 축소됐다)에겐 보다 차가운 느낌이 돈다. 다이앤 크루거의 어떤 점이 이런 비전에 딱 들어맞은 걸까? 쿠엔틴 타란티노의 <바스터즈: 거친 녀석들>에서 배우이자 스파이 역을 맡은 그녀(과거에 모델과 발레 무용수로 활동했다)는 자신의 터프한 면을 보여줬다. 그리고 프랑스 영화 <페어웰, 마이 퀸>에서 그녀가 변신한 마리 앙트와네트 역시 평범한 베르사유의 장신구가 아니었다. 디자이너이자 매니징 디렉터인 로베르토 스턴이 자신의 원석에 냉철한 느낌을 더했다. 그래서 터프하고 모던한 날카로움이 깃든 보석들이 그녀에게 제격이다. The effect of the pink-tinged pavé-set diamonds on a rose-gold framework has inspired the jeweller to define the collection as a “punk rock” look. 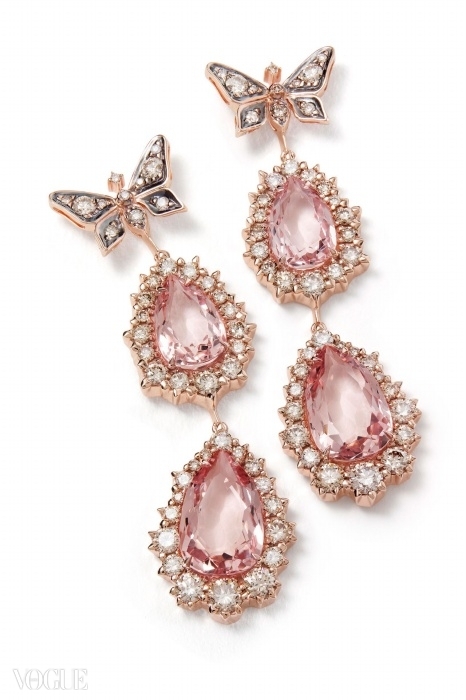 I am not convinced that these jewels “rock”. That makes the effect sound urban and tough, while I would see it more as nature showing its true colours. It is not quite “red in tooth and claw”. 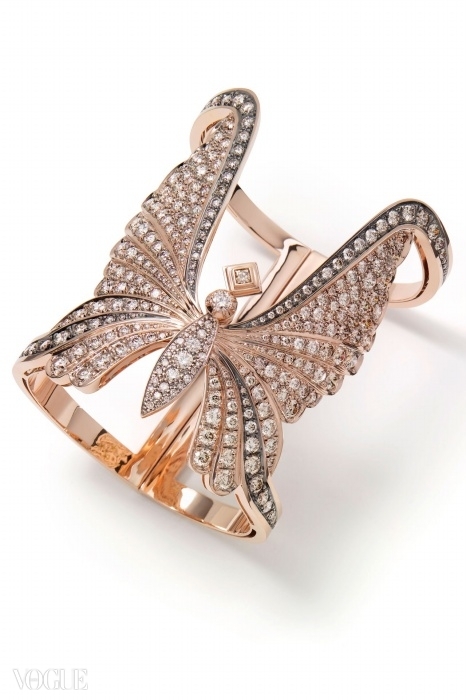 But the butterflies especially – for example on a deep cuff – are geometrically curved rather than suggesting a delicate flutter. 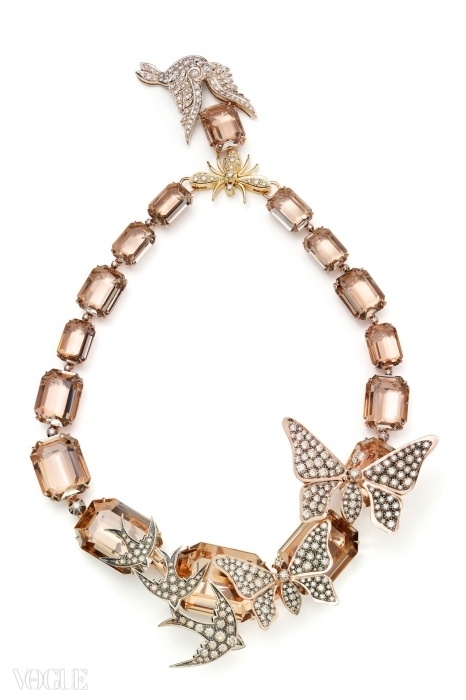 The most dramatic piece is a smoky quartz necklace decorated with birds, butterflies and a bee at the nape of the neck. This bold design gives a sense of nature’s abundance. But there is also a chillier feel to birds winging away at the onset of winter – interpreted by their wings being reduced to abstract geometric objects. Where does Diane Kruger fit into this vision? In her role as filmstar spy in Quentin Tarantino’s Inglourious Basterds, the actress – formerly a model and ballet dancer – showed her tougher side. And even her version of Marie Antoinette in the French film Les Adieux à la Reine was not the usual Versailles frippery.